1) H.R.H. Prince (Gyalsay Dasho) Jigme Khesar Namgyal Wangchuck , who succeeded as H.M. Druk Gyalpo Jigme Khesar Namgyal Wangchuck, Mang-pos Bhur-ba'i rgyalpo, King of Bhutan(s/o Tsering Yangdon) - see below. 2) H.R.H. Prince (Gyalsay Dasho) Jingyel Ugyen Wangchuk. b. 16th July 1984 (s/o Dorji Wangmo), educ. Lungtenzampa Middle Secondary Sch, Yangchenphug Higher Secondary Sch, Choate Rosemary Hall, Wallingford, Connecticut, USA, and St Peter’s Coll, Oxford (BA 2007). Appointed as Heir Apparent to his elder brother, 14th December 2006. HM’s Representative & Presdt Bhutan Olympic Cttee (BOC) since 2009. Mbr Olympic Council of Asia (OCA) Standing Cttee since 2011. Trustee Tarayana Fndn since 2003. Rcvd: the Royal Scarf (28.8.2007), King Jigme Khesar Namgyal Coron Medal 1st class (6.11.2008). 3) H.R.H. Prince (Gyalsay Dasho) Kumsum Singye Wangchuk. b. 6th October 1985 (s/o Sangay Choden), educ. Lungtenzampa Middle Secondary Sch, Yangchenphug Higher Secondary Sch, and RMA Sandhurst. Cmsnd as 2nd-Lieut Royal Bhutan Army 16/12/2005. Rcvd: King Jigme Khesar Namgyal Coron Medal 1st class (6.11.2008). 4) H.R.H. Prince (Gyalsay Dasho) Jigme Dorji Wangchuk. b. 14th April 1986 (s/o Tsering Yangdon), educ. Lungtenzampa Middle Secondary Sch, and Yangchenphug Higher Secondary Sch. Rcvd: King Jigme Khesar Namgyal Coron Medal 1st class (6.11.2008). 5) H.R.H. Prince (Gyalsay Dasho) Ugyen Jigme Wangchuk. b. 11th November 1994 (s/o Tsering Pem). Rcvd: King Jigme Khesar Namgyal Coron Medal 1st class (6.11.2008). a) Dasho … b. at Samitivej Sukhumvit Hospital, Bangkok, Thailand, two weeks before 15th September 2006. 2) H.R.H. Princess (Ashi) Sonam Dechen Wangchuk. b. 5th August 1981 (d/o Queen Dorji Wangmo), educ. Yangchenphug Higher Secondary Sch, Choate Rosemary Hall, Wallingford, Connecticut, Stanford Univ (BA 1999), Palo Alto, California, and Harvard Univ (LLM 2007), Cambridge, Massachusetts, USA. Advocate in San Francisco and at the High Court of Bhutan. Trustee Tarayana Fndn since 2003. Rcvd: King Jigme Khesar Namgyal Coron Medal 1st class (6.11.2008), KGC of the Crown of Tonga (with collar) and King George Tupou VI Coron Medal (31.7.2008). m. at Mothithang Palace, 5th April 2009, Dasho Phub W. Dorji, educ. Yangchenphug Higher Secondary Sch, George Washington Univ (BA) and Georgetown Univ (MA), Washington DC, USA , joined Ministry of Finance 2004, son of Dasho Wangchuk, from Takchu Gonpa, by his wife, Aum Ugyen Dolma, from Gaselo. 3) H.R.H. Princess (Ashi) Dechen Yangzom Wangchuk. b. 2nd December 1981 (d/o Queen Tsering Yangdon). HM’s Representative for people’s welfare in Mongar since 2006. Rcvd: King Jigme Khesar Namgyal Coron Medal 1st class (6.11.2008). m. at the Dechencholing Palace, Gonpa, 29th October 2009, Dasho Tandin Namgyel, son of Dasho Kipchu Dorji, sometime Auditor-Gen of the Kingdom, by his wife, Aum Chimi Wangmo. 4) H.R.H. Princess (Ashi) Kesang Choden Wangchuk. b. 23rd January 1982 (d/o Queen Tsering Pem), educ. Yangchenphug Higher Secondary Sch, Choate Rosemary Hall, Wallingford, Connecticut, and Stanford Univ, Palo Alto, California, USA (BA). HM’s Representative for people’s welfare in Bumthang since 2006. Rcvd: King Jigme Khesar Namgyal Coron Medal 1st class (6.11.2008). m. at Dechenchholing Palace, Gonpa, 11th November 2008, Dasho Palden Yoeser Thinley, educ. Mahidol Univ, Thailand, son of Lyonchhoen Jigmi Y Thinley, by his wife, Aum Rinsy Dem. 5) H.R.H. Princess (Ashi) Euphelma Choden Wangchuk. b. 6th June 1993 (d/o Queen Sangay Choden). Rcvd: King Jigme Khesar Namgyal Coron Medal 1st class (6.11.2008). 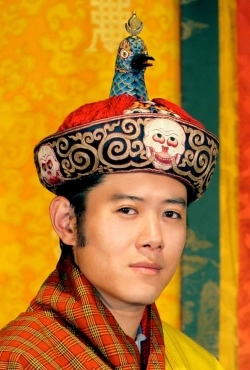 2006 H.M. Druk Gyalpo Jigme Khesar Namgyal Wangchuck [Jigs-med Khe-gsar rNam-rgyal dBang-phyug], Mang-pos Bhur-ba'i rgyalpo, King of Bhutan. b. 21st February 1980, eldest son of H.M. Druk Gyalpo Jigme Singye Wangchuck, Mang-pos Bhur-ba'i rgyalpo, King of Bhutan, by his third wife, H.M. Queen Tsering Yangdon, educ. Lungtenzampa Primary Sch, Yangchenphug Higher Secondary Sch, Cushing Acad, Ashburnham, and Wheaton Coll, Norton, Massachucettes, USA, and Magdalen Coll, Oxford (M. Phil. 2003). 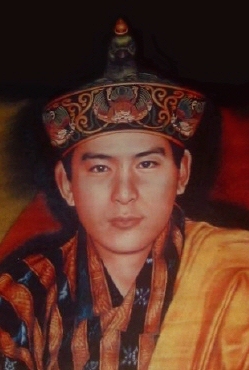 Installed as Crown Prince at the Dechenphodrang Palace, Punakha, 31st October 1988. Represenaive to the 27th UN General Assembly a New York 2002. Appointed as 16th Chhoetse Penlop 21st October 2004, and invested at the Zimchung Nang of the Trongsa Choekor Rabtentse Dzong, 31st October 2004. Succeeded on the abdication of his father, 14th December 2006. Crowned by his father at the Dratshang Kuenra, Tashiccho Dzong, 6th November 2008. Chancellor of the Royal Univ of Bhutan since 2003. Hon LLD (Univ of New Brunswick, Canada 2005, and Calcutta Univ, India 2010), Hon Dr PPE (Rangsit Univ, Thailand, 2006). Chief Patron Scout Assoc of Bhutan. Chair Bhutan Trust Fund for Environmental Conservation. Presdt Bhutan-India Friendship Assoc. Patron of the Royal Soc. for the Protection of Nature (RSPN), Bhutan Shooting Federation (BSF) 1997, India Bhutan Fndn, European Convention of Bhutan Socs, Oxford Centre for Buddhist Studies, and Bhutan Chamber of Commerce and Industry, etc. Rcvd: KGC of the Order of Queen Salote Tupou III (14.5.2010). m. the Pungtang Dechen Phodrang Dzong, Punakha, 13th October 2011, H.M. Queen Jetsun Pema (b. at Thimphu Hospital, 4th June 1990), educ. Little Dragon Montessori Sch, Sunshine Sch, Changangkha Lower Secondary Sch and Lungtenzampa Middle Secondary Sch, Thimphu, The Lawrence Sch, Sanawar, Himachal Pradesh, and St Joseph’s Convent, Kalimpong, India, and Regent’s Coll, London, crowned by her husband following the marriage ceremony 13th October 2011, daughter of Dhondup Gyaltshen, of Trashigang, a commercial airline pilot with Bahrain Airways, by his wife, Aum Sonam Choki, daughter of Dasho Thinley Namgyal, of Pangtoe Goemba, Bumthang, by his wife, Aum Rinchen, of Chorten Nyinpo-Chumbi, Chumey, Bumthang.